Pour the vodka, gin, rum, and triple sec into a glass with ice. 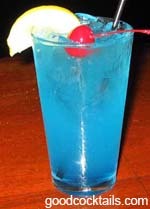 Fill with sweet and sour and add the float of Blue Curacao. You could add 1/2 oz of tequila if you like.